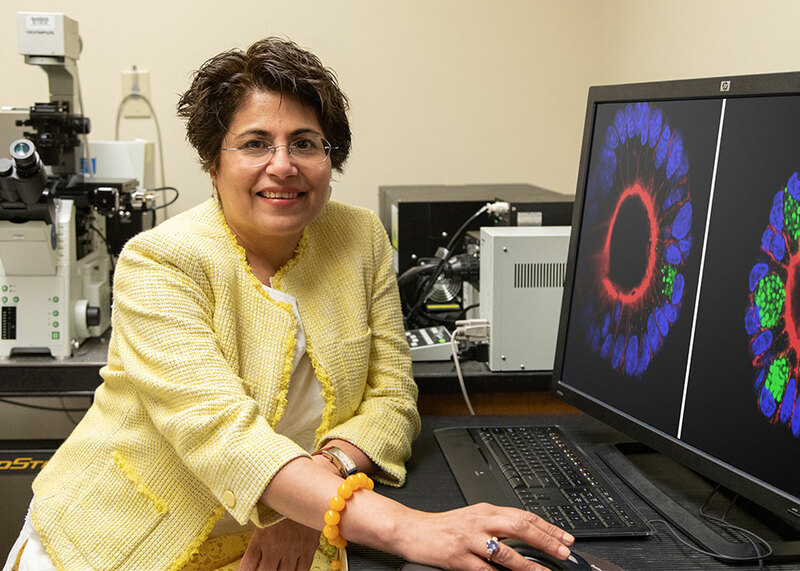 How cells talk to each other, and what they say, has long held fascination for Seema Khurana, professor of biology and biochemistry in the College of Natural Sciences & Mathematics. Recently Gastroenterology Journal published her findings about how defects in the conversations between actin molecules and the protein EIF2A (that warns of incoming cellular stress) are linked to the development of Crohn’s disease. “We believe our studies will advance scientific discovery, and in the future, permit rapid translation of basic science to model new therapies which could advance patient care,” said Seema Khurana, biologist at UH. Now with a new $2.3 million grant from the National Institute of Diabetes and Digestive and Kidney Diseases, Khurana will continue monitoring cellular cross talk to find new targets for drug development that could push Crohn’s into remission. That leaves room for researchers to hone in deeply to where the disease might gain access to the gastrointestinal tract, through the lining of gastrointestinal cells called the actin cytoskeleton. It is now considered a molecular pathway involved in the development of the disease. “We discovered that actin is a sensor of cell stress, so if there’s a defect in the sensor and it can’t sense danger, it can’t communicate to warn the cell to adapt. Alternatively, the sensors can be abnormally and chronically activated,” said Khurana, who examined stem cells isolated from Crohn’s disease patients to study these defects in cell stress signaling. When cultured in the laboratory, these stem cells form mini guts that maintain most of the defects seen in the intestinal tissue of Crohn’s disease patients. The number of people with Crohn’s disease, a chronic, relapsing inflammatory bowel disease, is rising across all ethnic and age groups, with as many as 70,000 new cases diagnosed every year in the United States. Patients with Crohn’s are also at risk for small intestine and colorectal cancer. “Our unique findings reveal that in intestinal epithelial cells, acute changes in actin dynamics modulate the cell stress response determining which cells survive and which die, influencing signaling that is pivotal to inflammation and Crohn’s disease development,” said Khurana. Under particular scrutiny are villin and gelsolin, two actin-binding cytoskeletal proteins in the intestine that Khurana has already found precipitate changes in actin. Using samples from people with Crohn’s disease, Khurana will identify new targets for medication that could reduce inflammation in the gastrointestinal tract while at the same time testing existing medications, already approved by the U.S. Food and Drug Administration for other ailments, for the treatment of Crohn’s. To examine the cells, Khurana is using a new experimental approach combining in vitro (in a glass) studies in intestinal epithelial cells, culturing stem cells isolated from patient biopsies and cultured ex vivo (outside the living organism) as mini-guts, as well as in vivo (inside the living organism) studies using state-of-the-art approaches. “In addition to conceptual and translational innovation, this study also provides technological innovation by demonstrating that stem cells from patients can be used in the laboratory to generate mini guts to test potential new therapies or drug cocktails in order to provide effective, targeted individual therapy to patients with Crohn’s disease,” Khurana said. Her work stands at the intersection of pathology, which describes disease states, and physiology, which describes the processes operating inside an organism.